I've never been a beer drinker, so when I go to a pub and everyone else is ordering beer, I generally order cider if they have it. I've noticed that a lot more places have cider now than even, say, five years ago, so I think I'm probably not the only one who would rather have it than beer. Used to be that a lot of places had no cider at all. Now, almost everywhere has cider, at least in the can, and some even have it on tap. Usually if they have it on tap, it's the old standby - Strongbow - but a couple of nights ago, I went out for supper to a pub, and they actually had Sir Perry's on tap! I couldn't believe it. Strongbow - the first cider I started drinking, in my late teens. I still have it now at bars, but when I buy cider at the store, I tend to go for other stuff. Gaymers - I love this one, although you don't see it much in bars. It's one of the cheaper ones at the LCBO, but it's amazing. I like it better than Strongbow. More apple-y, very nice. Rekorderlig - This one is gooooood. It's not an apple cider - it's a wild berry cider, but it still has that cider tang, even though it's considerably sweeter than the usual dry apple ciders. It's really yummy. If you like fruity drinks, but also like that kind of "tang" that cider has, you'll love this stuff. Even if you're not the type to like fruity drinks, this might get you. Sir Perry - This is a pear cider as opposed to an apple one. It's SO GOOD. It's a dry cider - you'd expect a pear cider to be really sweet and cloying, but not this one. It's delicious. Blackthorn - I'm not crazy about this one. Not sure why - just don't like the taste. But I know other people who swear by it. County Cider - From The County! Prince Edward County, for those of you not from Southern Ontario. :) When people from The County say "The County" it's like Torontonians saying "The Centre Of The Universe." :D Anyhow, County Cider isn't too bad, although it's not my favourite. I'll drink it if nothing else is around. Wapoos - Made by County Cider. Don't like this one much at all, although again, I know others who love it. Other County Ciders - This is interesting, haven't tried their other stuff. I'll have to check them out the next time I'm visiting my dad. I might like their other fruit stuff better. Bulmers - Tried this one at a bar one time. It is quite expensive, but I liked it. But I don't like it enough to pay a premium for it at the liquor store when I can get Gaymers and Rekorderlig there for considerably less. Thanks for the topic and the recommendations. I'm a little bit jealous of all your choices. The Manitoba Liquor Commission only stocks the Blackthorn, Extra Hard Green Apple and the Granny Smith, none of which are especially great ciders in my opinion. I'm hoping they may be able to bring in some of your favourites. I make my own cider. Five gallons pure apple juice, 2 pounds dextrose, one packet montrachet wine yeast (or champagne yeast if you feel like slumming it) and pow: best cider (apfelwein, really) you've ever tasted. It's delicious after two weeks, but after six months, it's sublime. I'm thinking it might be a little bit more complicated than that but it also sounds like it would be worth the effort, thanks for the recipe. I'm wondering though why using the champagne yeast be "slumming it"
Cider is a great way to get your five daily servings of fruit! I've had plenty of Strongbow, it being sort of the Budweiser of ciders (ubiquitous, lots of marketing) and Sir Perry's (couldn't they have picked a less goofy name?) which is almost like a sparkling wine. I've heard of, but never tried, mixes of cider and beer ("Black and Gold" when mixed with a stout such as Guiness, "snakebite" when mixed with a lager, and not really "mixed" so much as "carefully layered"). It's my understanding that the whole is greater than the sum of its parts, inebriation-wise. Or in simpler terms, "it'll getcha gooned". There is a pub in Kingston, officially called "The Kingston Brewing Company" but that the locals just know as "The Brew Pub". When I lived there, they had Snake Bite on tap. (I think they might have mixed their Dragon's Breath with Strongbow or something, can't remember). As someone who doesn't like beer, however, I didn't like it much. But it's a huge favourite, so if you're a beer person AND a cider person, I'm sure it's delicious. Was at a place a couple of nights ago where they had "Sir Perry" on tap. That's the first time I've seen it on tap anywhere. It was of course much better than the canned version. I've also recently heard of this "mix" of (usually) Strongbow and Guiness. Will have to try it some day. Anyhow, yeah, it was WAY better than in the can, although it's not bad in the can either. I'm curious about what people consider to be good food pairings with different types of cider. Personally, I can drink any of them with pretty much anything, but for instance, I find that the dry ciders go particularly well with greasy pub grub type stuff (like fish and chips). ennir, I assure you, it's not any more complicated than that. And you will be amazed at how good it tastes (you will regret, but are perfectly able, to cut the recipe in half or in four). I only say 'slumming it' because Montrachet yeast is harder to find. Champagne yeast will yield great results too. Mix them all, put them in a carboy with an airlock (total investment about 25$ or less on Craigslist) and enjoy! I'm not a fan of the Irish soda pop ciders like Bulmers and Strongbow. I like dry English cider, or cloudy cask cider. When cider is good, it is very, very good. Sounds great, Catchfire! I'm going to have to try that sometime! Ironwood cider is nice too (scroll down, they don't have a direct link to the product beyond the list). It's not sold in the liquor store because they don't make enough for the LCBO, but I tried it on a trip through the Niagara wine region in June, and it was really nice. But we'd already broken the bank buying wine on the trip, so we didn't get it. I think if I ever get back there, I'll get some - although their fruit wines were to die for, and I'd probably buy those first if I had to choose. I'm reminded of a cider product from my youth called 'Light 'n Easy'. I have recollections as a teenager of drinking it the local park well before noon with my friends who were skipping summer school. God was it awful. You could feel the hangover right through the bottle. I hope they no longer make it. I often wonder how I turned out as well as I did. Are you sure it wasn't called "Nice 'n Easy"? Did it come in flavours like "Auburn", "Blonde" and "Ash Brown"? Fruit-wine-wise, it's hard to beat the rich layering and complex structure of Boone's Farm Strawberry Hill... the wine of my childhood. I make my own apple juice (apples and water in a really powerful blender). Could I use that? Or would I need to strain out the pulp? And how would I store it? Do I need a bunch of glass bottles and one of those capper things? Thanks for the recipe, by the way . I'm going to try it. You could definitely use that, Rosa. You'd probably make the best apple cider the world has ever seen. I just started a batch last week using organic apple juice from a local farm and I'm salivating at what it will taste like come spring. You ferment it and age it in the carboy (basically a glass or plastic bottle that looks like an office water cooler) with an airlock until you're tired of waiting. I make beer too, so I can bottle mine in Grolsch type bottles with a siphon rod and tubing. But if you just stick to cider, you can bottle it in growler jugs or wine bottles. If you want it carbonated, be sure to add a 3/4 cup of dextrose (in a cup of boiled water) to the cider just before you bottle (i.e. after it's already fermented). It'll be ready to drink one week after bottling. I was never really a fan of mixing cider and beer, although I know people who like it. But then again, I never really went for neopolitan ice cream either. Okay, so first you do it in the carboy, then you pour it into bottles and wait a week for that too? Being a BC girl who can't drink wine or beer, I favour Okanagan peach or cherry. There is zero good selection for BC ciders here in Trawna, so every suitcase coming back from the Coast is stuffed with it. On the dry apple cider side, this summer I came across "Stutz" in the Annapolis Valley.. .dry with sweet overtones, light but lovely apple taste. It's not available here, alas. I was disappointed with Wapoos but Ironwood isn't bad. Applewood Winery near Stouffville does a nice dry raspberry /apple cider with their own produce. Worth a trip-- they're very friendly and their mead is to die for. Scrumpy! When I was in the Cotswolds for my gran's funeral about seven years ago, we went to a 500 year old local pub to toast her. I went to the bar to ask about local scrumpy. Well moi dear, says they, you're 'ere at the roight toime as the locals is all ready fer drinkin. They lined up seven glasses on the bar for a taste, each made by different local sources and apples. By the end I was wobbling and they wouldn't accept a pence from me. Thanks for the tip about Applewood Winery...that just might be close enough to check out! No car, so it's not easy to get to the Niagara wine region since I don't really know anyone out that way. Dissolve 2 pounds (6 cups) of dextrose (corn sugar) in 5 gallons (19L) of 100% pure, no preservative, Apple juice and put in a sanitized carboy. You can of course do as little as 1 gallon, but it's as easy to make a large amount as it is a small. Add one 5 gram packet of virtually any kind of dry wine yeast, but Montrachet and Champagne are best, in that order. If you prefer a sweeter cider, you can use a neutral ale yeast like Nottingham which will ferment out sweeter. Make sure it all goes in. Cap with an airlock half filled with water or cheap vodka. This allows air (CO2) to escape while keeping a seal on the bottle. It will ferment in less than two weeks, but leave it for at least a month. I usually leave it for three. The spent yeast cells will gather at the bottom of the carboy. Fermenting between 65 and 70 degrees Fahrenheit (18-21C) is best, but read the yeast packet for best temps. Anything above 80 F (27 C) and it will produce evident off flavours. When you want to bottle, siphon the cider into a big stock pot (at least 19L!) or food-grade sanitized plastic bucket (although sanitation isn't as big an issue now, because your cider is loaded with alcohol), leaving the sedimented yeast behind in the carboy. Taste the cider. If it's too dry for your taste, you can add a non-fermentable sugar like lactose or 'wine conditioner' at this point to get the desired sweetness. Add 3/4 cup of dextrose, dissolved in an equal amount of boiled water and mix well. This sugar will ferment and produce CO2 (i.e. bubbles). If you have aged it in the carboy for more than two months, you'll need to add another packet of yeast to get bubbles. Bottle immediately, either in sanitized wine bottles (probably easiest, but you will need a corker from your local wine-making shop), Grolsch-type swing-top bottles, or growler jugs (with tight, tight seals--this could be hard if you like really bubbly cider). Bottling can be done with the proper equipment, just a siphon tube, or even just a funnel, a pitcher and steady hand. Wait two weeks--enough CO2 will be produced after one week to 'pop' the cap or cork, but the second week will dissolve the gas in the cider. The cider will get better with age: the yeast drops out and the apple flavours really come into their own. My best schedule is two months in the carboy, four months in the bottle. Drink the best damn cider you've ever tasted. Start a second batch because you will drink all the cider you have disturbingly quickly. This will yield cider about 8.5% abv. If you leave out the two pounds of dextrose, it will be about 6%. Consume with caution. Babbling is not advised post-consumption. This recipe is for filtered apple juice, but virtually anything will work, including apple 'cider' (unfiltered apple juice, essentially--the sediment eventually settles to the bottom of the fermenting vessel and your cider goes clear). I've only used apple juice and cider before, but people report using apple-grape juice, apple-cranberry, apple-peach juice with great success. It's so easy, and you can't go wrong. ETA: Also don't put the carboy anywhere you need to breathe. For the first two weeks or so, it's a gonna stink. Great instructions, thanks for posting that. So...on the way to Trenton this morning, we stopped in - you guessed it, Stouffville! I thought, what the heck, I hardly ever have a car, and no transit goes close enough to the place, so we decided to go up to the Applewood Winery on Green Grouch's recommendation. Delicious mead and cider! We got a flat of the cider and a couple of bottles of the mead, which I agree, is to die for. Apple cider envy. LOL Enjoy. I'd love to try Sir Perry. Some of the posters here may not know that perry is the proper name for fermented pear beverage, so it isn't such a gimmicky name. Perry is poiré in French. It is very delicate and very good, whether made in France or England (don't know if it is made elsewhere in the UK). Good perry isn't more than a bit sweet. I'm looking forward to picking some up next time I'm in Ontario (most likely in Ottawa). Growers cider is soda pop - yecch. We have very good dry apple ciders here, but they aren't cheap. I don't like sweet beverages, hot or cold, alcoholic or not. Neat tea, black coffee, dry wine, cider and perry. Alas, while I appreciate fine beers, I can't digest beer well - just one and I feel bloated for hours. I'm curious about what people consider to be good food pairings with different types of cider. We have galettes de blé noir with cider. It's a Breton tradition. We even bought bolées a cidre to go with our cider and galettes. Breton cider is obviously what one would like to have with galettes, but I don't know if it's available anywhere in Cnada. We go with what we can find, such as BC Growers "Dry" cider. There's a kind made by Big Rock breweries that's closer to the earthy Breton taste, but it's still not the same. As I wrote in another thread, I've made cider from crabapples. First we run the apples through a juicer, then add wine yeast and a couple of crushed campden tablets to the juice, and let the mess ferment for a couple of weeks before bottling. I linked to an discussion about places to find galettes in Toronto. I don't know about there, but I do know of a place in Parksville, B.C. 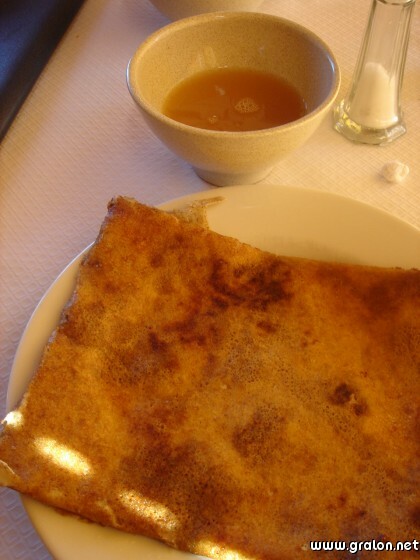 called Le Triskell, whose owner comes from Brittany, that has really good galettes. They use BC cider too. Breton cider is available here in Québec, and we have many dry local ciders, some very fine indeed, and some of which are very similar to the Breton type. There is a local foods shop in Jean-Talon Market that also sells Québec ciders, meads and wines (as well as microbrewery beers). Québec wine is not worth the price - Ontario is as local as I'll go - but there is excellent cider. I've never had mead (honey wine) I don't find too sweet, even the so-called "dry" styles, but I hate sweet drinks, boozy or not. My favourite is Magner's, myself. I think it's Irish. There's also a nice Australian one called Mercury Cider. Never been a big Strongbow fan. I find it too carbonated. I mainly drink beer but cider is a nice way to mix it up, especially if it's really hot and you're on a patio. And, man, now I really want to try to make my own! There's also a blueberry one from Newfoundland that is delicious. Can't remember the name. Newfoundland also makes an amazing blueberry wine. And for some reason, it's actually kosher so thats what I always bring when visiting an observant family for dinner. My cider from the fall harvest is ready for drinking. I used five gallons of organic apple cider from a local farm and a few pounds of dextrose for added kick. As usual, it is scrumptuous. I've got two cases of champagne bottles worth. Who's coming over? Where in Toronto is Sir Perry's on tap? We had gallettes again tonight, so yesterday I went to the LBS to buy cider. I usually pick up "Growers" (the "Sun-Rype" of ciders), but checked the label and saw written thereon something like "apple-flavoured cider-like alcoholic beverage" rather than "apple cider." How do you say "beurk"" in Breton? I bought a jug of "Okanagan Premium Cider" instead. Any cider that has ice(!) in it as a serving suggestion is automatically barred, in my books. I keep trying the commercial Canadian ciders, and I've generally been very disappointed. But there is one exception, the William Premium cider, which is as good as any of the mainstream Brit ciders. But still, there's nothing available here that compares to the ciders of Bretagne. BTW, as I understand it (haven't been there myself), Belgians regularly serve their ciders over ice. I have had Belgian cider; it's got the flavour to stand up to some ice. Say, Lard, are you the guy who visited Vendée this year? ( I have trouble keeping track of who says what sometimes). Anyway, if you are that guy you probably know that just a bit north of there the locals make kir breton, which is cider with crème de cassis added, just as in plain kir, which is white wine (usually muscadet) with cassis. I'm not the guy. Been across a few times, but not this year. Lard, there are excellent Breton and Norman type ciders here in Québec. We can't get them in Ontario, it seems. I was the guy in the Vendeé this year. Sadly, I did not have a chance to partake in that particular concoction, although I remember the Normandy cider (and cassis) with appreciation. Last time I tried strongbow I was very disappointed. It used to be a favorite. (But ciders do change a bit from season to season). Bulmers make a bunch of different brands of cider. (They own a lot of land around Gloucester and use it for apples and hops) and they have some farmers in southern ireland too. My xwife and I used to get about a dozen different brands when we lived back in Ireland and try and decide which brand was best. Usually after 3 you couldn't decide anymore. I have to agree, growers peach is very good and consistent. And it is Canadian too. They also make a good apple cider. But not as good as their peach. Ha, nice bump, Brian. I just made another 5-gallon batch of cider from Denman Island apple juice. It should be ready by next spring. I only have two bottles left from last year, so I might have to start another batch in a few months. I like this thread. And here's a bump just in time for the holiday season. Our local maker space guy in Victoria got a lot of windfall apples. A pickup load! I wonder if I should join Makerspace Victoria? How long does it take to make a batch? I like dry ciders - Strongbow and Blackthorn all the way. Oh - I'm sorry, I didn't see this question way back when! They have it on tap at Sarah's, at Danforth and Monarch Park. Very nice little pub. Also, at Morgan's on the Danforth (used to be Taps and Tales, just changed names recently) at Danforth and Linsmore (Greenwood subway) they have Rock Creek cider on tap. Sir Perry's is also available at my regular pub, Betty's, at King and Sherbourne. It's not as ubiquitous as Molson Canadian but it's not especially hard to find either. Is it on tap or in the can, though? At Betty's it's on tap. For some reason, I don't like it from the can and can only drink it as a pint. Cans are available at the LCBO but I never get them. I'm more of a beer guy but Perry's is a nice change, especially during the summer. During winter, I'm more likely to go with Strongbow for cider. Or Guiness beer of course. And many of the great ontario micro beers. My favourite at the moment is Duggan's #9 IPA.